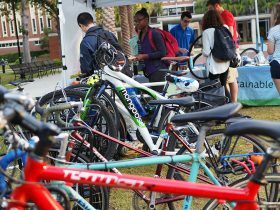 Join Sustainable UF for Bike to Campus Day on Wednesday, Nov. 28, 7-10AM. We’ll be set up on the Plaza of the Americas to welcome bike commuters with a free breakfast and information about bike programming on campus. Look for the tent with the bike racks next to it for a convenient place to stop and refuel for the day! Bike to Campus day will have refreshments, information about Gator Go: Bikes, UPD Bike Registration and Light giveaway. It’s intended to welcome those who ride their bikes to campus as well as spread awareness of other campus bike resources. 7 Resolutions for Sustainability at UF!